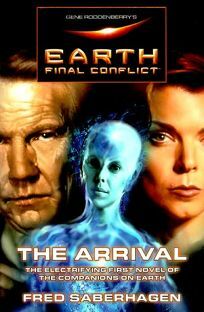 With this enticing novel, the prolific Saberhagen (Ariadne's Web, reviewed above) offers a prequel adventure to Gene Roddenberry's popular television series Earth: Final Conflict. Multibillionaire Jonathan Doors is the focus of this account of the first visit to Earth by deep space Taelons and of the formation of the human Resistance. The Taelons come bearing ""many wondrous things,"" including a possible cure for Doors's wife, Amanda, who is dying of cystic fibrosis at the dawn of the third millennium. Despite the Taelons' apparent goodwill, Doors struggles with his distrust of the aliens, especially when they evidence a sinister curiosity about his recently purchased Hearst estate, the art-filled San Simeon. While Doors puzzles over the real motive of Taelon emissary Va'lon, Doors's father, Jubal, shows up with a tall tale about a high-profile party that took place at San Simeon in 1936. Jubal, then 16, was invited to the party to accompany a young Marilynesque starlet, but while there he stumbled into some intergalactic trouble. Jubal's detailed account of his ""trip of a lifetime"" picks up the novel's previously dragging pace, and his descriptions of a space station where ""re-adaptation"" occurs convey a vivid sense of aural and spatial disorientation. When the Taelons' actions confirm his father's story, Doors goes into action. The ensuing excitement includes a miniwar, a cleverly disguised superpower entity that gives the Taelons a run for their money and, in the novel's frantic conclusion, some old-fashioned knuckle-sandwich work: in other words, space operatics enough to satisfy any fan. (Dec.) FYI: In February, Tor will release the second novel in the Earth: Final Conflict series, The First Protector by SF veteran James White.